Our goals are quality and excellence. A commitment that involves any Group department through the compliance of certified procedures. Quality in not an abstract concept. 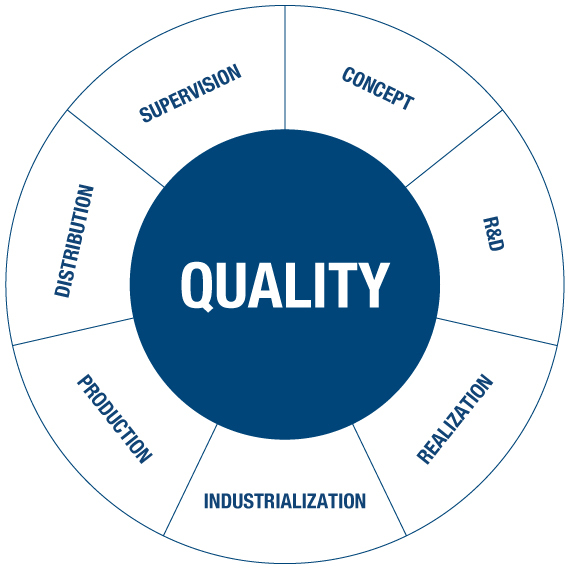 It is a continuous process of production, control and quality improvement, applied at every stage of processing, in every sector and department. It means satisfying the needs and expectations of the client and of the consumer. It means operating in conformity with all health regulations regarding quality, safety and environment. and applies the logic of continuous improvement in the various business areas, in pursuit of excellence in the field of quality, safety and environment. cGMP - current Good Manufacturing Practices. Authorisation AIFA (Italian Medicines Agency) for the Group’s pharmaceutical factories for the production of medicines. Integrated management system for quality in the Group’s facilities. Certification for the health and safety of workers. International standard of food quality and safety for the production of dietary supplements. International quality standard for the production of cosmetics. Integrated management system for quality in the Group’s facilities for the production of medical devices. Our Policy on implementation safety and environmental directives.